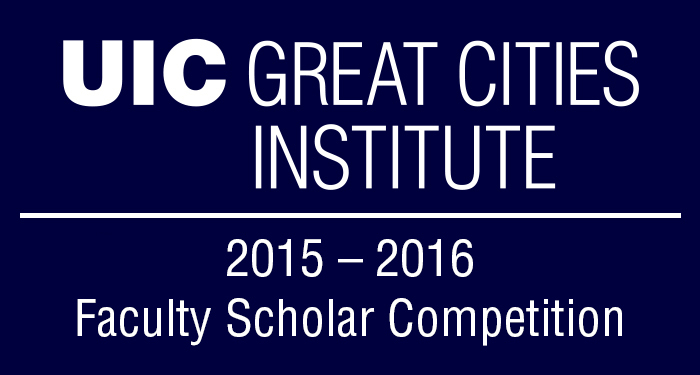 Great Cities Institute is pleased to announce the 2015-2016 GCI Faculty Scholars. A criterion for judging the proposals was the extent to which they address UIC and GCI’s Great Cities Commitment to connect scholarship and the quality of life in cities and metropolitan regions. Since 1995, the Institute has appointed 161 Faculty Scholars from over 34 different departments and units at UIC. The GCI Faculty Scholars Program provides awardees the opportunity to conduct research that contributes to their professional development, enriches their respective academic disciplines and leads to changes in policy and professional practice outside the academy. The 2015-2016 Great Cities Institute Faculty Scholar Competition was guided by GCI’s commitment to encourage collaborative, cross-disciplinary research on topics that affect the quality of life of people living in Chicago, its metropolitan region, and other great cities and urban regions around the world. Priority was given to proposals that have a high potential to promote synergy among scholars working on a topic related to UIC and GCI’s urban missions, create enduring collaborative relationships, and attract funding from outside the university. In the 2015-2016 academic year GCI will incorporate new GCI Faculty Scholars into its local and regional governance cluster. The upcoming GCI Faculty scholars may also participate in GCI’s employment and economic development cluster as well as the dynamics of global mobility cluster.